Located in Porec (pronounced por-etch), this amazing Basilica is a Unesco World Heritage Site and one of Croatia's top sights. Built between 543 and 554 by Bishop Euphrasius, the Basilica has nine naves, marble columns imported from Constantinople and fine sculpture. 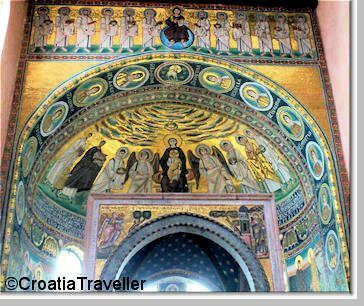 Yet, most visitors stare in wonder at the glittering Byzantine mosaics in the apse. At the very top, Christ on his throne presides over his twelve apostles. Below, Mary is seated on a celestial globe surrounded by angels. On the left is Bishop Euphrasius with a model of the Basilica in his hand. To the left of the windows is an extraordinary representation of the Annunciation with a beatific Mary. 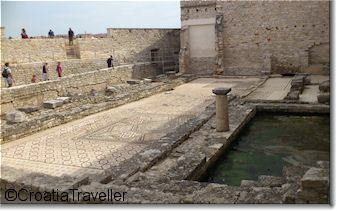 Next door is the Bishop's Palace, now a small museum that contains other mosaics and ancient stone fragments. Don't miss the fish mosaic which is thought to date from the 4th century. Part of the structure includes remnants of the 4th century Basilica upon which this "newer" version was constructed. Little remains but the rectangular floor plan, some walls and columns and an early mosaic. The visit to the Euphrasian basilica begins with a visit to the Bishop's Palace and museum, then progresses to a climb to the bell tower before finishing with the mosaics. Although the climb up the bell tower offers a nice view of Porec, the narrow wooden stairs can reach gridlock during the tourist season.